← How to convert pdf file to bmp image? 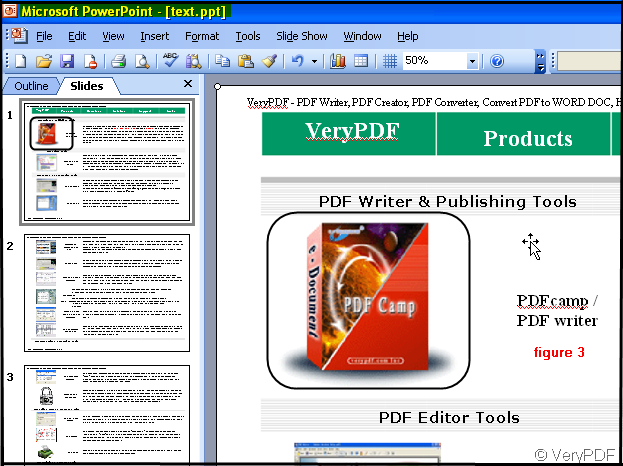 Let’s see how to use PDF to PowerPoint Converter. If you meet any difficulty when you download this software, please refer to this article. http://www.verypdf.com/wordpress/201110/who-can-tell-me-how-to-download-the-pdf-to-powerpoint-converter-3978.html , it will help you down it successfully. Downloading has been finished then we can use it. In my opinion, illustrating by pictures is a good way to put the instructions easily and accurately. At beginning, we should start from the interface of the software, like “figure 1”. The part i have marked in yellow are the menu list. You can choose the out PowerPoint layout and mode. You also can choose the page range which means the converted page from pdf file to PowerPoint. If the source document has password then please input it at the “PDF Password”. If you have chosen your option, click “Convert”, you will get and PowerPoint file. I will show you the detail operation in “figure 2”. How to combine multiple documents into single PDF? How can get ride of the pictures in a pdf file? Why the words can not be edited after converting the pdf file to PowerPoint by PDF to PowerPoint Converter? If I want to convert the pdf file to PowerPoint then adjust the text position in PowerPoint, how can I make it?